On Sunday August 1, longtime CNN international correspondent Christiane Amanpour will take over as host of ABC's This Week, replacing ex-Clinton operative George Stephanopoulos. 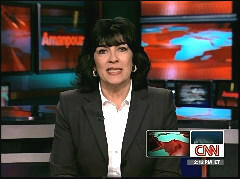 Amanpour, who is married to Jamie Rubin, Assistant Secretary of State for public affairs during the Clinton administration and an adviser in 2007-08 for Hillary Clinton's presidential campaign. Argued the press was 'muzzled' and not tough enough on President George W. Bush. Warned of scary 'totalitarian' Christians. Quite oddly juxtaposed French President Nicolas Sarkozy's criticism of rioters with his welcoming of Barack Obama. — CNN's Christine Amanpour to Hillary Clinton in Macedonia after a tour of refugee camps, May 14, 1999. Elian, Learn Ballet on the Farm! — CBS 60 Minutes correspondent Christiane Amanpour on a star of London's Royal Ballet, May 21, 2000. – CNN's Christiane Amanpour on CNBC's Topic A with Tina Brown, September 10, 2003. — CNN's Christiane Amanpour to French Prime Minister Dominique de Villepin, Anderson Cooper 360, Nov. 29, 2005. — Correspondent Christiane Amanpour in her August 23, 2007 profile of "Christian Warriors," the last of CNN's 3-part special on "God's Warriors." — New ABC host Christiane Amanpour to Speaker Nancy Pelosi on This Week, August 1, 2010. — Host Christiane Amanpour to White House advisor David Axelrod on ABC’s This Week, September 26, 2010. — Amanpour to Senate GOP leader Mitch McConnell later on the same program. Is America's Islamophobia Suppressing Muslims' Freedom? — ABC’s Christiane Amanpour to JFK’s sister Jean Kennedy Smith in an interview shown on Nightline, January 20, 2011. — ABC’s This Week, March 6, 2011.